How well can cinema help us understand something as inconceivable as a war? That's the problem with the remarkable They Shall Not Grow Old, which arrives a few months too late for the centennial of the Armistice. Peter Jackson, of The Lord of the Rings trilogy, weaves together documentary footage from the 1914–18 war and oral histories by 114 Western Front vets recorded a half-century ago. In a prologue, the New Zealand director explains that he was given great latitude in working with a hundred hours of footage from the Imperial War Museums. It took him and his team four years to digitally cleanse, colorize and adjust the speeds of film from hand-cranked cameras. Footage, underexposed or overexposed to the point of uselessness, now reveals its details. As a result, the front becomes visible onscreen as it never has before. The jerky black-and-white phantoms, marching in their puttees and tin helmets, now move like human beings and have faces that can be studied. There are no dates, no names of spring offensives or locations, just one long voyage. First the enlisting—the Army took people as young as 16—the training, and the boat to France. Then the marching to the zigzagged trenches, teetering on slippery duckboards over corpse-littered mud deep enough to swallow a man like quicksand. Behind the lines, there's toil or mild recreation: thin beer, brothels and ball games. Away from the front, the men pose with delight for the cinema camera, displaying captured German spiked helmets, and snuggling with the regimental goat. Midway through, that new secret weapon arrives, the tank. The images here are clear enough that you can see the names painted on the sides of these oval-shaped steel monsters. At the blowing of a whistle, it's over the top and into the face of the machine guns, through barbed wire snarled as thick as a blackberry patch. This film is an achievement, but one feels that something is lost in translation, and it's because of the narration. These old men are great subscribers to British understatement, and are observers of the law that one mustn't grumble. They Shall Not Grow Old helps us understand WWI, the scar between the old world of kings and horses, and our own world of total war and regimentation. It's invaluable but has little immediacy—a strangely placid look at something that happened so long ago. 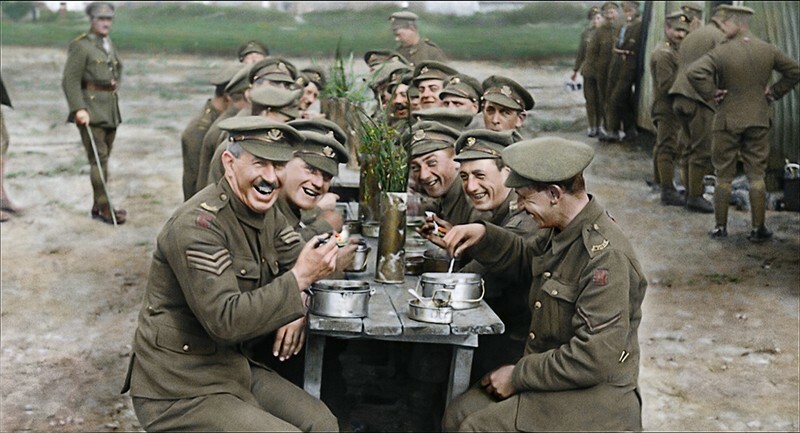 'They Shall Not Grow Old' is playing at select theaters.